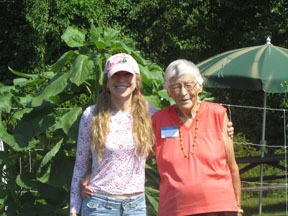 The Garden Angel program of University of Maine Cooperative Extension matches Master Gardener Volunteers with others of limited financial means, who also love to garden, but are no longer physically able to without help. The recipient and angel come up with a mutually agreed upon set of tasks to accomplish. Regular visits are set up throughout the growing season. Together they plan, plant, care for and harvest vegetables and flowers from a small garden on the recipient’s property. UMaine Extension will provide gardening information to the participants and act as a resource for any gardening questions they may have. There is NO COST to participate in this program, however, recipients should understand that it is the intention of this program to assist those individuals who could not otherwise afford to pay for gardening help. Garden Angels cannot recommend or apply any kind of pesticides (including herbicides or insecticides). For more information about the program and how to become a Garden Angel, contact Kathleen McNerney at 1.800.287.1471 (toll free in Maine) or at kathleen.mcnerney@maine edu, visit our Garden Angels web page, or download and fill out our Garden Angel Brochure and Application (PDF).